The City of Inverness (FL) Water Reclamation Facility was recognized by the Florida Water Environment Association (FWEA) for excellence. 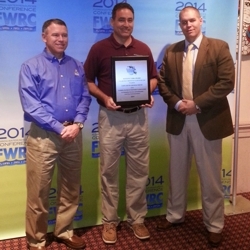 The facility operation received the David W. York Award for its water reuse system. The award is given by the FWEA Water Reuse Committee to honor utilities for their commitment to, and their accomplishments in, developing and maintaining exemplary reuse programs. Hoyle, Tanner provided design, permitting, bidding and construction administration to expand its current permitted capacity of 1.5 MGD to 2.0 MGD, utilizing a more modern and regulatory acceptable BNR process to improve nitrogen removal thus allowing the plant to meet Class I reliability. The design also included the necessary filtration and disinfection for the effluent to meet Florida Department of Environmental Protection Public Access Reuse (PAR) standards, allowing the effluent to be pumped over three-miles, via a new pipeline and pump station, to the Inverness Golf and Country Club for irrigation purposes. The reclaimed water reduces by over 70%, the continual need to draw over a million gallons per day of fresh groundwater from the Floridian Aquifer.